My Confession: "I have a Really Active Imagination, and always have." it is impossible to separate my life from my writing. As a kid, I raised racing homer pigeons and still do––just like Kevin in TPC––but that is where the similarities between us end. I also lived in Coeur d’ Alene, ID like Misty, Kevin’s romantic interest and that’s mostly all I have in common with her. I have long been fascinated by dreams, first as a child, then as a Child and Family Therapist, and later in public schools as a Child Development Specialist. Dreams certainly form the fabric of The Pigeon Catcher (TPC) but I have never known anyone exactly like Kevin’s neighbor, Haley. Is she based on a real person? No, although she was somewhat patterned after me because our early childhood dream experiences were quite similar. And in many ways, Haley has been the most real fictional character of my experience. If you have already finished that book, you most likely know what I’m talking about. Is Mr. Bridger from TPC story based on my life? No. I have never worked in a sleep lab in Portland or anywhere else. But he and I are both Licensed Clinical Social Workers with public school counseling experience. I knew some things about The Pigeon Catcher plot, but it came as a complete surprise to me in chapter eight (or was it chapter 9?) when Kevin and Misty heard a knocking sound that interrupted their conversation. If the noise came from his door, the source would be his mother, yet I also knew the tapping could have originated from his bedroom window. If so, I had no idea who'd caused it. Curious to find out, I had Kevin go to the window where he discovered the little neighbor girl, Haley. Thinking back, I can’t imagine that story without her. Included here is one of Kevin's rare drawings of Haley. To hear from her directly, check out my web page titled Visitor. Read an excerpt from TPC under Samples in the navigation bar. To order a paperback copy of TPC, go to Store up in the navigation bar and then follow the link or if you have a Kindle (or the right Ap) you can get a copy from Kindle. In my early twenties, I lived in the "boonies" of the North Idaho panhandle. Winters were long, harsh and boring. Consequently, I read a lot of books. Especially paperback novels given to me by my grandfather or passed along by my brother. My Idaho horse-logging experiences formed the background for the novel Country Cousin in the Wild Woods, set in Oregon’s beautiful Hood River Valley. Why is that Top Banner ⬆ with my BIO? I'm glad I thought to ask myself that question. 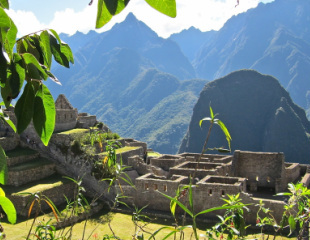 During a previous summer, I traveled to Peru to do research for Matt and Mimi Among the Incas, one of the books I'm working on. I'm not sure what I expected to find in Peru, but there were many surprises, all totally unforseen. For one thing, Lima has more people than New York City, plus beautiful ocean frontage. I also believe they have more joggers per capita than any other large 3rd world city I've visited. 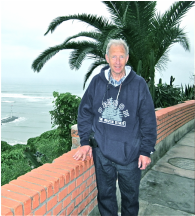 This is me in Lima at a location where joggers frequent. It doesn't rain in Lima, but the sun doesn't shine through the mists, either. I wonder if folks there suffer from SAD (Seasonal Affective Disorder)? It didn't look like it. One of my biggest surprises was the number of coincidences I encountered on my trip. When I got home from Peru and was reviewing my photos, I came across this one. For a moment, it made me think the shadow of Indiana Jones had snuck into the picture. But no, it was just me at Machu Picchu with my new hat on while taking a photo of a portion of their water system. Then I noticed similarities between four of the five pictures I included in the top banner of this page. 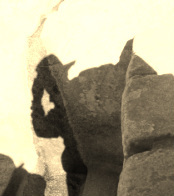 The shadows cast on a stone wall at Saqsaywaman near Cusco resemble those of the book cover illustration for Matt & Mimi in the Middle Ages (M&M for short) that I had drawn over a year previous to that trip. The shadows from my photo in the top banner above here (second from right) seemed to meld into the shadow of a young man when I slipped it next to the adjoining picture in the banner. 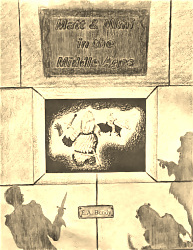 Likewise, each picture's shadow blended into the shadows of the adjoining picture, including the drawing I had made for the cover of Matt & Mimi In the Middle Ages. Some people looking for the first time at the five separate photos linked together think they are seeing only a couple different photographs. Was it simply a coincidence when a traveling companion and I went into a book store in Machu Picchu City (the modern town) and as I enquired about books that explained the construction of Machu Picchu our conversation was interrupted by an archaeologist who gave us facts about Machu Picchu and marveled that we were there for the winter solstice day. He noted we would also be in Cusco on the day of the most important ceremonial festival all year with a reenactment of ancient traditions. YPA was my first book in the series of that name. It details the adventures of American youths traveling in foreign countries, mostly to Europe. The YPA tour groups combine students from around the United States. In the second volume of this series, tentatively titled Young People Abroad: The Bridger Memorandum, I brought together Haley from TPC with characters from some of my other stories such as Country Cousin in the Wild Woods. ⬅ That is me in the very right of the photo, with a necktie no less! In actuality, I traveled under very similar circumstances to the characters in these stories when I accompanied middle school students during several summers on educational tours. (As in the photo) Of course, we did not actually meet royalty or have encounters with––but I digress. Before too long, I'll have an excerpt available, but until then, look at some of the other book samples. Not long after I encountered Haley in TPC, I wondered what would happen if she met Harry Potter. I knew that could never occur, but the concept fascinated me. Would their worlds collide, or could they somehow blend together? It wasn’t until I began writing The Not-Witch when I realized I could one day bring Haley and Sean together in my travel book series (YPA) for a collision of their world views. I particularly look forward to working on that story (series?). This is another good question I'm glad I asked. The short answer is everywhere! One occurred when I was in my office in one of the schools where I worked and I overheard some parents talking. A backpack had been left unattended and a cell phone rang inside of it. There were no office staff there at that moment and one of the parent volunteers could hardly contain herself. She wanted to answer that phone in the worst way—almost a compulsion. I chuckled about that situation. Later, driving home, I thought if there had been an ADHD (hyperactive) boy unattended in the office when a phone rang in a bag, he would have answered it. Then what would he do? I began to ponder what could happen, especially if he and a girl with anxiety disorder were both there unattended when the phone rang. That scenario became Abe and Nikki’s War—a novel still in progress. I wrote a five-page story for our retiring librarian about an eccentric gentleman named Grandfather Longnapper. Matt and Mimi are his grandchildren, and their names were courtesy of a young friend of mine. The concept of the novel was a hidden room of special books in the school library. It contained volumes with magical power to transport their readers to any place imaginable, past, present or future. That initial short story soon became the middle grade novel, Matt and Mimi in the Middle Ages. Grandpa Longnapper transformed to become Professor Longstrider, an archaeologist at somewhere like the University of Oregon. I decided to use some Middle English dialog occasionally, but could not locate a suitable dictionary and ended up creating my own from the works of Chaucer. I’m still working on that novel. In the meantime, Cornelia Funk published Inkheart, which had a similar concept about stories coming alive, and even before that there was the classic, The Never Ending Story. Titled: Jamison Pond: The Spy Who Came Down with a Cold this story was the result of a comment by an editor to the effect there needed to be an Alex Rider-type novel for middle graders. I made a note about the idea, not really intending to write such a book in the tradition of Ian Fleming’s James Bond stories. But the odd thing was that I had this compulsion to jot down some character names and brief personality descriptions. One page led to another, and I soon had the beginnings of a novel that I couldn’t stop writing. A book I never really intended to create in the first place just kept flowing out of me. I uncharacteristically set aside my other projects to complete the Jamison Pond rough draft in record time. That was unusual because I generally work on a half-dozen books at once. When I get bored with one, I jump to another. Maybe I’m a little bit ADD, which is ADHD without the hyperactivity. I’ve now finished two-thirds of the sequel titled Jamison Pond: The Spy Who Dumped Me. And I'm making notes for a third novel. Originally titled Captaine Dreade: The Highly Sensitive Pirate, I shortened it to simply be Captain Dreade. This novel arose out of a childhood love of reading about Black Beard and his ilk. That was followed by my discovery of Alexander Dumas’ works and the novels of Sir Walter Scott. To be honest, those have not stood the test of time for me the way Stevenson’s Treasure Island has. After reading Avi’s book about Charlotte Doyle, (which I loved) I reread Treasure Island, and then I could not help but do a lot of research and write my own pirate story. In fact, It is now published and I’m half done with the sequel. There is more information on Captain Dreade at the bottom of my Home page, or check out the sample pages in the navigation bar under Samples. You can purchase Captain Dreade through the STORE in the navigation bar. I have been strongly influenced by the book On Writing. Before reading that book, I struggled to fit into a "writer's box" that did not work for me. I seldom know what will happen in my novels ahead of time. Therefore, outlining each story isn't feasible. On Writing helped me to give myself permission to be who I am as a writer; I was so grateful when I found it. And yet, at the same time, I know my style of writing is not for most people. There is value in outlining because it can keep one focused so the story doesn't ramble and become incoherent. MY CURRENT METHOD is this—in any given week I rough draft portions for several different works in progress, and do editing on still others. I am totally random in that way, but it seems to work for me. Members of my critique group have asked how I keep everything straight. I really don’t know. It is just how I function. TRYING TO GET MOST OF THEM PUBLISHED? The answer is simple, but the result is complex. I had completed The Pigeon Catcher and sent queries to publishers and agents while I was in the process of rough drafting two sequels and a prequel, plus working on Country Cousin in the Wild Woods. Then I read an interview of an author who had signed a multi-book deal. He expressed concern because he had to publish each book in the series as he completed them (a logical situation). His fear was that he would get to, let’s say, book five and realize there was something really exciting he could have done in that book, but in order to make it work he would need to change something major in book one of his series—now in print and unalterable. I had never thought about that problem before. The more I pondered, the more it bothered me. was to rough draft as many books in the series as possible before seeking publication of my first book, now long-since completed. During the process of fleshing out The Pigeon Catcher series, I started writing Young People Abroad to the British Isles. Wouldn’t it be interesting to pull Haley out of her setting in The Dalles, and throw her together with other kids from Oregon and around the United States on a trip to France? Yes, so that's what I've done, which became The Bridger Memorandum. The Pigeon Catcher, Henrietta H. House (February, 2012) and Captain Dreade (October 2012). Then came Spider Wars and Phillip Marrow, Jr. The Private Eye (in the start of the new year, 2013). And also in 2013 (March, I think) Country Cousin in the Wild Woods became a paperback novel. In 2014, Wild Horse Girl appeared, which is a sequel to Country Cousin. That was also followed in 2014 by Dark-Dreams Girl, a prequel to The Pigeon Catcher. If you would like to order any copies, just click STORE up in the navigation bar and then follow the link(s). The first two are also available on the KINDLE. This website is where we will keep track of the ongoing publication process.